Hong Kong winters are relatively mild without much wind, heavy rain, hail or snow. But our skyscrapers light up with festive lights and the city is aglow in neon and bright green and red Christmas lights. While temperatures may not often go below 10 degrees Celcius, our homes and offices are bereft of heaters, so in comparison to colder cities, our days and nights can feel quite chilly. Even those who are not Christians celebrate Christmas in one way or another. Children look forward to gifts, friends and relatives gather together, sharing delicious food. In a city as cosmopolitan as Hong Kong, where multiple cultures blend and collide, Christmas involves a diverse array of dishes. One of our favorites during this winter season is hot pot in its myriad forms. Hot pot, as the name implies, consists of broth, which is heated and as it is boiling different ingredients are dunk into the pot to cook. Hot pot’s origins are debated and one theory is that it originated during the Shang and Zhou dynasties (1600－211 BC). Beef, mutton and other ingredients were placed into a pot that was heated. Another theory suggests that hot pot originated during the Eastern Han Dynasty (25－220 AD) and was nearly exactly the same as the present hot pot as we know it. During the Han Dynasty, people used a ceramic or copper cookware with feet on the bottom which made the charcoal heating easier. Wu Shu Fu (the pot was divided into five cells with different flavor broths) first came out during the Three Kingdoms period (220－280 AD) and is similar to the current two-flavor hot pot. Throughout the history of hot pot, the container has hardly changed – it is usually made of copper, iron or earthenware. Nowadays, the most commonly used material is stainless steel. On the contrary, the methods of warming the pot has changed dramatically – from firewood, charcoal to gas and induction heaters. Typical hot pot ingredients consist of beef, lamb, pork, seafood, vegetables, soy bean products, mushroom, egg and noodles. 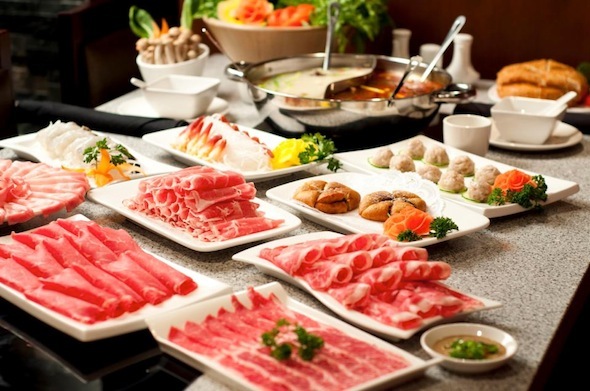 Hot pot has three key components: the broth or the soup, ingredients for boiling and the various dipping sauces. Dipping sauce is an indispensible part of hot pot and brings out the crucial point of the different ingredients. The dipping sauce usually consists of more than one ingredient. Mixing different ingredients create distinct palates and aromas and common combinations include: sesame oil and garlic, Sichuan chili oil and garlic, raw egg and sesame oil, green pepper and soy sauce. Other simpler sauces include tahini, fermented tofu juice, soy sauce or chili sauce. Hot pot is a popular holiday meal, not only because people can choose the ingredients according to each person’s own preference, but also because it is a communal experience. Young and old, friends and family can sit by the steaming pot, gobble down the food, and pass the ingredients around. The intense heat climbing from the hot pot and the warm and harmonious family atmosphere, create the perfect holiday spirit. Hot pot is one of the best choices for gatherings and holidays. With Christmas and New Year approaching, we recommend our favorite hot pot restaurants in Hong Kong, presenting diverse and distinctive hot pot styles. The most popular are instant-boiled mutton hot pot and pickled white meat casserole. The best known is the former mutton hot pot. According to legend, this cooking method spread from Mongolian to Beijing, so it is called “Mongolian Hot Pot” as well. Filled with features from Beijing food, ingredients include lamb, vegetables and tofu with various strong dipping sauces. The dish evolved to eventually include beef. Dong Lai Shun is a prestigious hot pot restaurant from Beijing. The base of this hot pot is cheese. Bread or potatoes are dipped into the melted cheese and the result is a hot pot that is equivalent to a cheese fondue. In Hong Kong, several restaurants have launched this ‘cheese hot pot’ and among the choices, we recommend the Swiss Chalet. The soup for this hot pot is normally light stock or satay soup, some restaurants even choose double-boiled stock. Its great feature is plentiful ingredients available to be dipped into the pot including beef, carp fish, geoduck, salmon, Kurobuta pork, all kinds of meat balls, sausages, dumplings and noodles. There are a variety of hot pot restaurants all over the city and one of the tastiest ones is Tao Heung Pier 88. Japanese-style hot pot has many variations: Shabu-shabu with miso soup or kelp stock as base with thinly sliced beef as one of the key dipping ingredients; Chankonabe, a common meal for sumo wrestlers, includes beef, chicken, soy bean products, vegetables and mushrooms in a big pot; Sukiyaki consists of a broth made of soy sauce, sugar, mirin and stock. Beef and vegetables are cooked then dipped into a mixture of raw eggs, soy sauce and sugar. A noteworthy shabu-shabu hot pot restaurant is Katte Shabushabu.